in your WIRELESS ENVIRONMENT ...those invisible pulsing microwave communications signals! 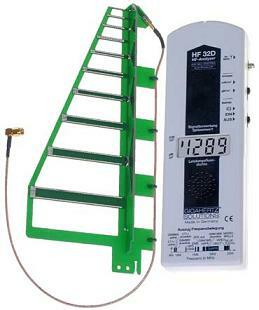 To check and monitor emissions from mobile/cellular phone base-station masts and towers,cordless telephones and baby monitors, computer w/LANs, microwave ovens, and allother microwave frequency sources operating between 50 MHz and 8000 MHz (8 GHz). Ideal for checking and measuring the microwave frequency electromagnetic radiation (EMR) around you, against best practice standards for the general public. An Amazing NEW meter, the size of a paperback book! The Acoustimeter is one of the most informative and satisfying instruments you will find anywhere - and with its extra-ordinarily wide Frequency Range (200MHz-8000MHz... 8GHz! ), it is virtually ’future-proof’ too. 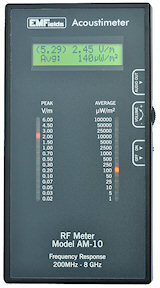 With the sound of our iconic Electrosmog Detector, combined with state-of-the-art measurement circuitry, the Acoustimeter tells you what you need to know, including both the average reading in microWatts per square metre, and the peak/highest reading detected (in Volts per metre) since you turned it on. 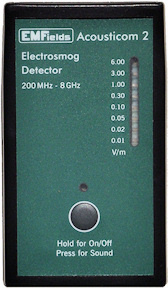 For a quick and competent digital assessment of microwave exposure between 800 MHz and 2.7 GHz. This range includes mobile/cellular phones, cordless phones, Wi-Fi, Wi-Max, Bluetooth, and computer/broadband wLANs. It has a patented directional antenna (usable to 3.3 GHz), and provides measurements from 1-1999 µW/m². (Our COM is in limited supply now - please see its next generation above - The AcoustiCom2!) Ideal for checking and measuring microwave exposure levels around you against best practice standards for the general public. We are now SOLD OUT of our first Electrosmog Detector, but have exciting new models coming, with a wider frequency range delivering more information. Please stay in touch! We will announce the new models soon! Iconic and indispensable, this broadband detector allows you to hear and assess all the invisible microwave emissions around you.